No GMOs Inside As Nature’s Promise, and more. No antibiotics. No synthetic growth hormones. The promotion’s reverse pschology approach is “Have You Seen What’s Not Inside.” And an interesting use of negative space with the “not inside” benefits small and visually whispered not large and shouted. A twin upright Floorstand Sign angles for your attention at aisle end. 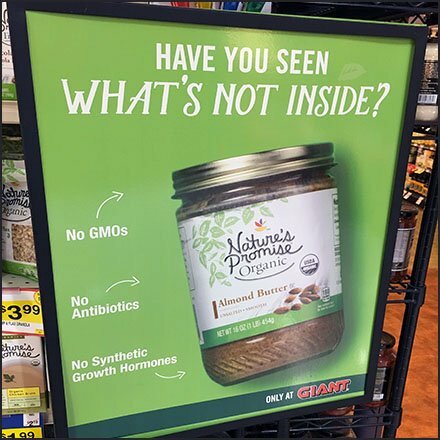 This No GMOs Inside As Nature’s Promise seen at Giant, Martonsville, Pocono Mountains PA.